Seriously? OMG! WTF?Zachary Levi Archives - Seriously? OMG! WTF? When are we going to get a Shazam and Aquaman buddy movie? 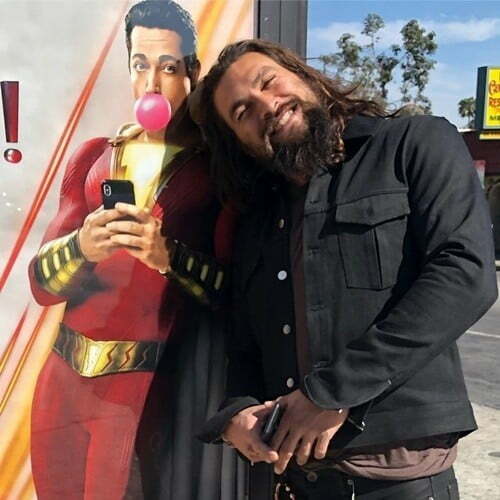 Jason Momoa was walking around town when he saw a poster for Shazam. He is so proud of his friends’, Peter Safran and Zachary Levi, work that he had to pose with it. Then he wanted to remind you to go see the movie on April 5th, just like you saw his film Aquaman. Which makes you wonder when are they going to do a feature together. I want to see the lighter side of DC Universe working together instead of the darker versions. Who is with me? BTW how awwwwwdorable is Momoa when he smiles big like that? Shazam asks the age old superhero question! How many times have you watched a movie about superheroes and asked how do they pee in their costume? Well, Zachary Levi’s Shazam asks that very question is the upcoming move? Will we find out if he did? We will have to wait until April to find out. So that gives us about 9 months to be excited about the PG-13 version of Deadpool. As in a fun(ny) superhero movie you can take the kids to and not worry about having to explain a lot of things to them afterwards. Is Chuck joining Psych the Movie? Psych the Movie is currently filming, but we do not know that much about it. We do that all the series regulars are returning, but that is it. Late last night, Dule Hill posted a video on Instagram with James Roday and asked what they were holding. Then Zachary Levi walks by and says, “I believe that’s a pineapple, isn’t that right Chucksters?” Does that mean that the recently blonde Chuck is going to guest star in USA Network telemovie? All we know is Gus added, “#Psych’Os #Chucksters…this just got reaaally interesting.” Which means unless we use our psychic abilities like Shawn, we will not know until December when it airs. I for one cannot wait for it! Hopefully, it will get a revival order by USA! I still miss the show. Would Zachary Levi do a Chuck movie? Back when Chuck was on the air, the fans would do anything and everything they could to keep it on the air. Now that it has been 5 years since the show ended, Zachary Levi revealed whether or not he is up to doing a followup movie for the popular spy comedy on Larry King Now. Now that a whole new audience found Chuck on Netflix (according to what Levi told King), I think the streaming service should bring it back like they did with Gilmore Girls and Full House. The fans would love it, they could have fun with it. So why not do it? Only condition is that Jeffster has to be part of the deal. No Jeffster, no Chuck revivial. Do you want a Chuck movie or are you happy with the way the show ended? As long as Subway is still around we can hopefully make it happen. You know, Warner Bros should just open a division that only handles revivals. Fans love their shows and wants to see them back on the small screen. Look at how many of their shows have been revived from the dead (Full House, Gilmore Girls, Will & Grace and Veronica Mars) and how many more they can make possible. That answer is endless and I would start with Everwood.